These are Easy Outs. We've all heard "You need an Easy Out to get out that busted stud". 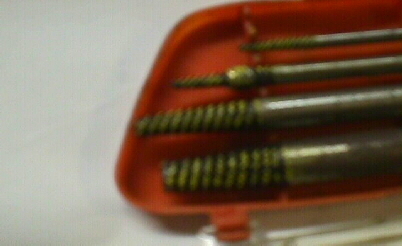 They work by biting into the sides of a hole you drill into the center of the broken bolt or stud. You can see a piece of a bolt stuck on one of the easy outs. This is a tool used to loosen radiator hoses. It comes in handy for lots of other stuff too! 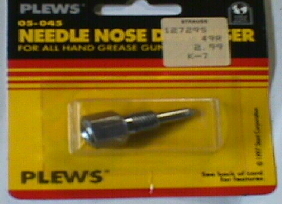 This is a needle grease gun tip. It's used to grease joints that don't have Zerk fittings, but rather what looks like a small roll pin, where the grease is injected. Like on the front driveshaft CV joints. This is an outside Caliper, used to measure outside diameters accurately. Better than a tape measure. 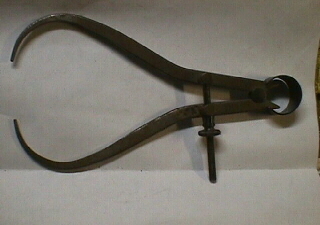 This is a tool used to set the gap of spark plugs. 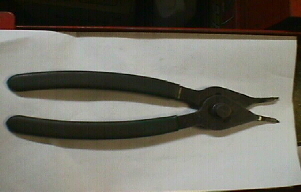 These are Snap ring pliers. 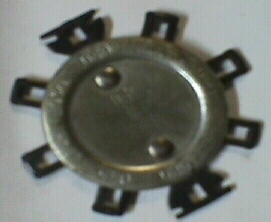 This one, is meant for external snap rings. This is a stubby drill. they are great, most body shops use them since they are 2 sided, and short, so they don't go far after breaking through while drilling a hole. They also can get into some tight spots, mounted in a right angle drill. Tools & Supplies by Eastwood - They have all these tools and more! Since 1986, the Vehicle Record System has set the standard for comprehensive, yet inexpensive, management software for tracking vehicle maintenance and expenses. You cannot reduce vehicle costs until you know exactly where your money is going. Only by knowing your complete operating and ownership costs and the maintenance history will you be able to spot problem areas and costs that are higher than average. The VRS Plus covers virtually every aspect of vehicle ownership and even displays photos of your different vehicles. It tracks cost per mile, fuel, tires, registration, loans, insurance, travel, vendors, driver expenses and much more. Find out why thousands of individuals and businesses rely on the VRS Plus. You may use this program absolutely free to track up to 3 vehicles. If you need to track more vehicles, you can register it as the Home, Business or Fleet Edition. Prices range from $24.95 to $161.95. Northern Tool - Plow Parts, Plow Lights, Hand tools, power tools, shop supplies, hoists, small engine parts, hydraulic supplies, body work tools, air tools, compressors, generators, pumps, tarps, and a whole lot more! Need metals for your next project? You can get them right here! Steel, aluminum, brass, copper, stainless steel, titanium, also plastics! Great source, easy ordering, and UPS Delivered right to your door. Truck Restoration Parts - Here Doors, Fenders, Rocker Panels, Cab Corners, Bed Floor Sections, Rear Wheel Wells, Rear Wheel Arches, Cab Floor Repair Panels, Radiator Supports, and A LOT more! Over 55,000 parts!